123RF Night Dom Tower and bridge, Utrecht, Netherlands. âUtrecht is a deeply satisfying city. It's everything you imagine about the Netherlands, gleaned from Dutch masters and the pictures on puzzle boxes. Gabled houses with crooked walls line crisscrossed canals. Every building is different, with a doll house sensibility, gleaming door knockers and long skinny windows through which you get glimpses of domestic life carried on behind pots of lurid tulips. You'll find cobbled squares and Renaissance towers and polished restaurants the size of cupboards, full of big people with creamy skin. There are hardly any tourists. If you want to be absorbed into local life, ditch Amsterdam and come here. It's a 25-minute train ride through semi-countryside of dykes and bridges and tidy factories. Huge electricity pylons stride across flat polders like modern-day triffids. The Netherlands is a high-tech country artificially afloat, but its towns stay quaint and seemingly old-fashioned. The bent metal roof line of Utrecht train station looks like a contemporary art installation. You walk through a shopping mall and across a road and step through a wrinkle in time. Ahead is a n Old Master of jumbled houses and wandering alleys below a cloud-studded sky. There are only passing anachronisms: lots of bicycles, plate-glass shop windows inserted into Dutch Golden Age facades. How do they get the windows so clean? You could come to Utrecht just to admire the gleaming windowpanes. And prettily presented cafÃ©s and gabled roof lines. Stay a while and soak up a hearty dose of Dutchness. In Utrecht, even the red-brick streets are laid out in a herringbone pattern like parquet. Lacquered doors are smart in red and navy, flanked by big pots of plants, fronted by iron railings gleaming like a soldier's boots. It would all be a bit too sweet if it weren't for the ferals sitting on doorsteps in the sun, the waft of marijuana from shop entrances, the scribbles of graffiti in ancient alleys. 123RF If you want to be absorbed into local life, ditch Amsterdam and come here. Anchor your idle wandering with some proper sightseeing. You can climb the cathedral tower and admire the old town, bisected with canals, from above. You can descend under the cathedral square for an archaeological look at this venerable city. There's a stately home built for the only Dutch pope (Adrian VI, if ever you're on a quiz show) and a World Heritage-listed modernist house. Centraal Museum is refreshingly different. It displays its art by theme rather than chronology, and has a terrific collection of Dutch designer furniture. You could shop in Utrecht if that's your thing. The Dutch come here from all over the Netherlands to plunder its specialist design and fashion stores. You'll find hipster hair salons and jazz-music sh ops and Belgian beer houses too. Jet-lagged? 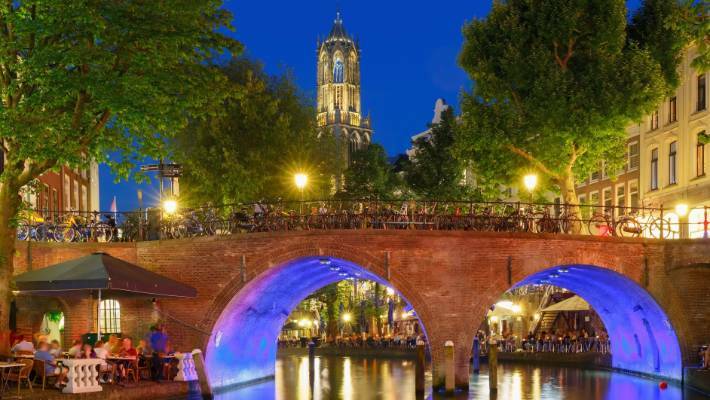 You could plunge into the nightlife in a city where a quarter of the inhabitants are university students, or follow the Trajectum Lumen, a city walking route that links illuminated bridges and wharves and historic buildings. Pedal the Oudegracht canal in the early morning before pedestrians make cycling an obstacle course. Later you could take to the canal in a kayak, passing former medieval warehouses now transformed into waterside eateries and bars. Partying Utrechters float by in boats, wine glasses clinking. Merry, but with none of the loutish, drunken behaviour you encounter amongst Amsterdam's tourists. Further from the centre you paddle under willow trees. Immigrants in shawls crack nuts on canal-side benches and the aroma of honey and spices drifts on the air like a reminder of Holland's trading past. Tall houses have gables pulled down over their ears like sensible Dutch bonnets. The c anals are stapled with arched bridges. It could be a scaled-down Amsterdam, but you're a thousand miles from Amsterdam's tourist-crammed clamour. Brian Johnston was a guest of Visit Utrecht.